With just a few preset Stipplr Actions any photograph can be converted into a sharp graphic novel style using Photoshop with relative ease. The term graphic novel was initially coined in 1964 and made popular by comic books such as the Watchmen, Dark Knight Returns and Sin City series as well as popular Japanese Manga art form. 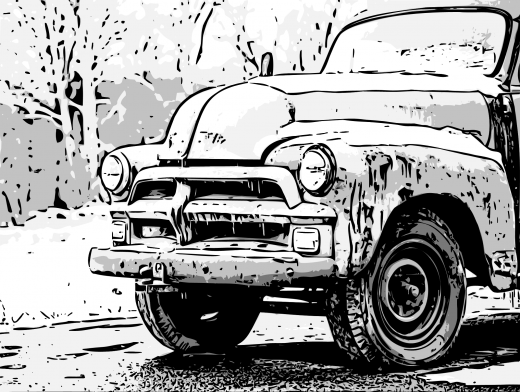 This tutorial post focuses around taking a landscape oriented headshot photograph and converting the result into a dark graphic novel style comic book. In this tutorial, one Stipplr Action will be used to prepare the photograph while exactly 4 other Stipplr Actions will be used to compose the graphic novel result you see as the featured image for this post. Why Was Merging Layers Required? Every photograph is different. Pixel resolution, focal depth, luminance, motion blur and other factors are often what makes a photo unique. The graphic novel effect applied to the headshot used in this tutorial was achieved through trial and error by rendering a few dozen Stipplr Actions followed by a few hours of experimental compositions until the right combination for this photo was found. This process of rendering and experimenting is not pertinant to the tutorial, but the designer (that’s you) should be aware that Stipplr Actions are not a magic bullet for graphic design — you still need lean on your own skills and aesthetics to create compelling compositions. 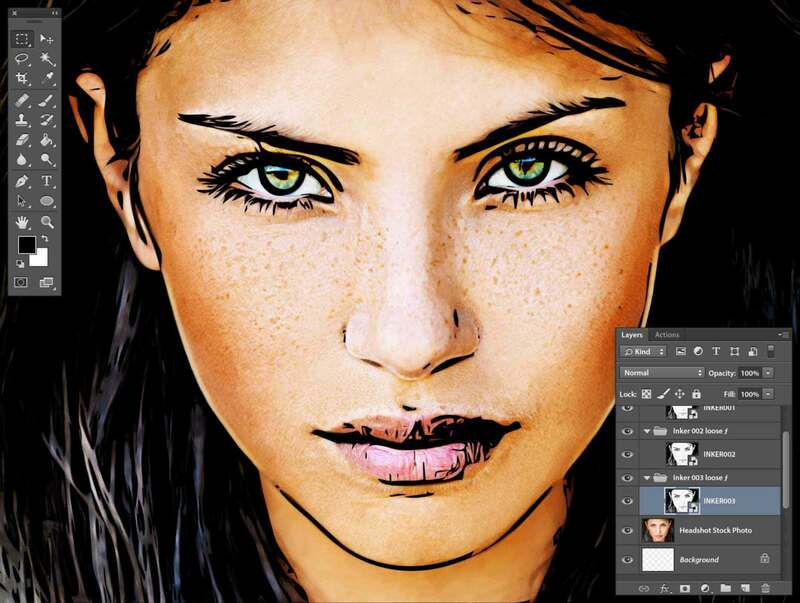 Before we start the process of compositing our Adobe shape vector layers to create a graphic novel style we first need to process the photograph to give it an overall darker tone. 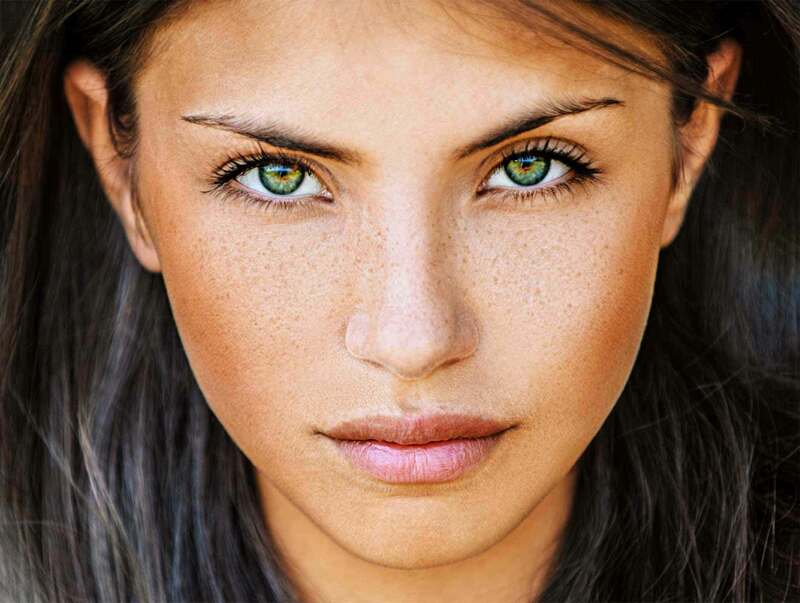 Stipplr Actions thrive on contrast, and while there is ample contrast provided by the subjects dark hair we need something with a slightly higher dynamic range. Our goal with preparation is to crop the photo such that her hair frames her face perfectly. To complete this illusion we will also need to do a few minor touchups to her hair to improve the visual balance between the left and right side of the photo. Remove green background poking through the top-left corner. 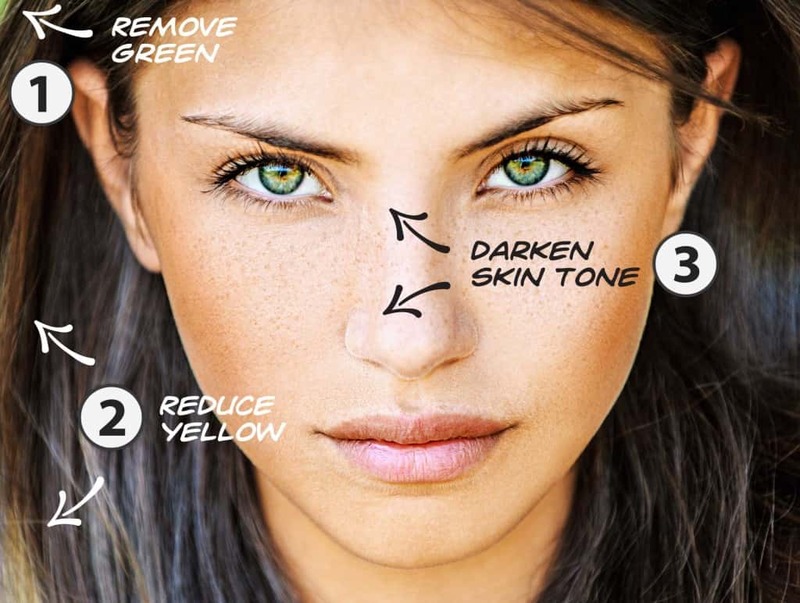 Reduce yellow tone visible in the hair on the right side of her face (her right). Curves Adjustment to darken photograph. The original stock photo headshot used in this tutorial measured 8512 × 5664 pixels, and after being cropped and scaled measured 2122 x 1600. It’s not much but the green foliage poking through the top left corner is enough to break the illusion that the subject is perfectly framed by her hair. Using the Clone Stamp Tool we will select a dark area of her hair to clone over the undesired area — shown below is the diameter of the Clone Stamp Tool we are using (300px with 0% hardness). The area immediately beneath the Clone Stamp in the image below represents the area defined as the source area to be cloned. Removing the green background is complete. Next up on our list is to remove the excessive amount of yellow from her hair, granted it wasn’t that much but it will affect our results. 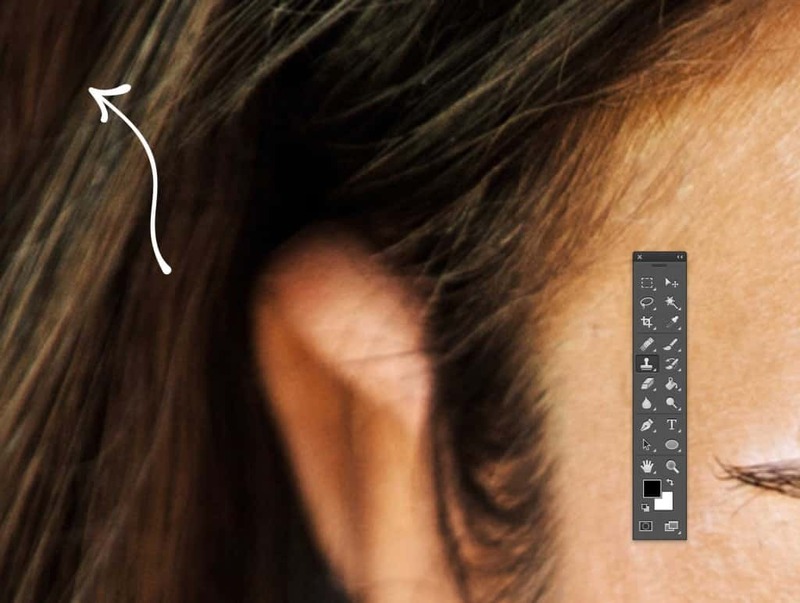 Using the Lasso Tool, we’ll select an area that covers roughly all the hair on the right side of her head (click the image to more clearly see the selection outline). Open the Hue/Saturation modal and select Yellows from the dropdown menu. Drag the Saturation slider all the way to the left until -100 is the value displayed. Reducing the Yellows in her hair is complete (the yellow along the left edge of the image above has already been removed). 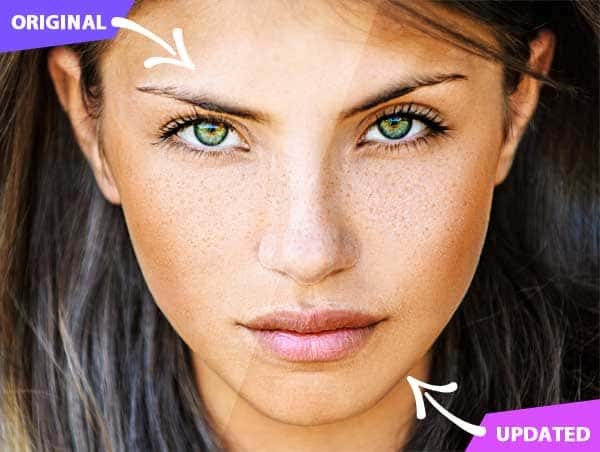 The final touchup before we begin applying Stipplr Actions to our headshot is to perform a very minor colour correction to the gray point using Photoshop’s Curve modal. This correction will reduce overall brightness in the photo while slightly increasing the contrast and saturation — exactly what Stipplr thrives on for tracing! 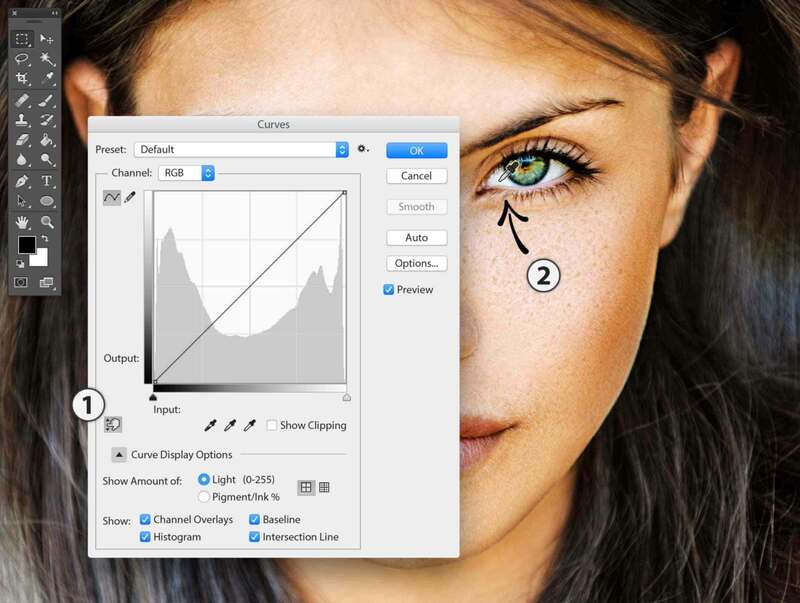 Open the Curves adjustment modal — Command + M (Control + M on Windows). 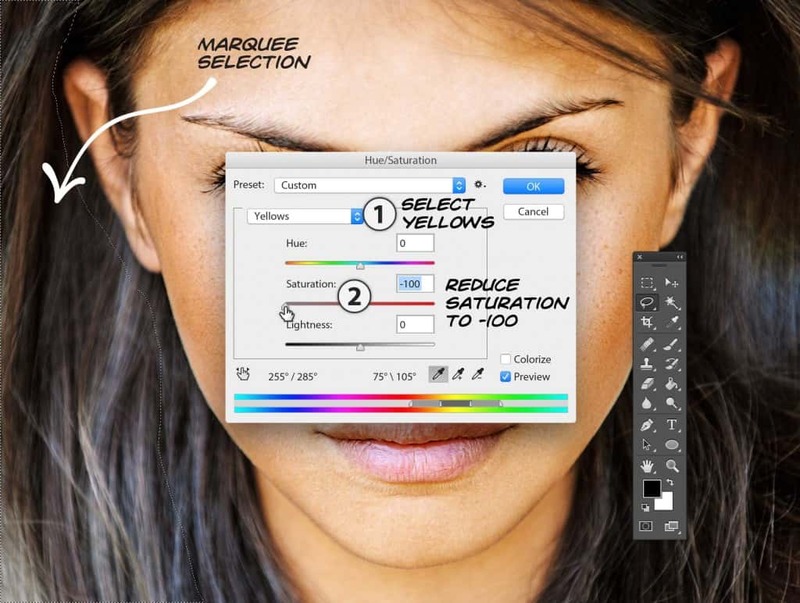 Select the On Image Adjustment Tool. Position the eyedropper over the inside portion of the model’s eye. 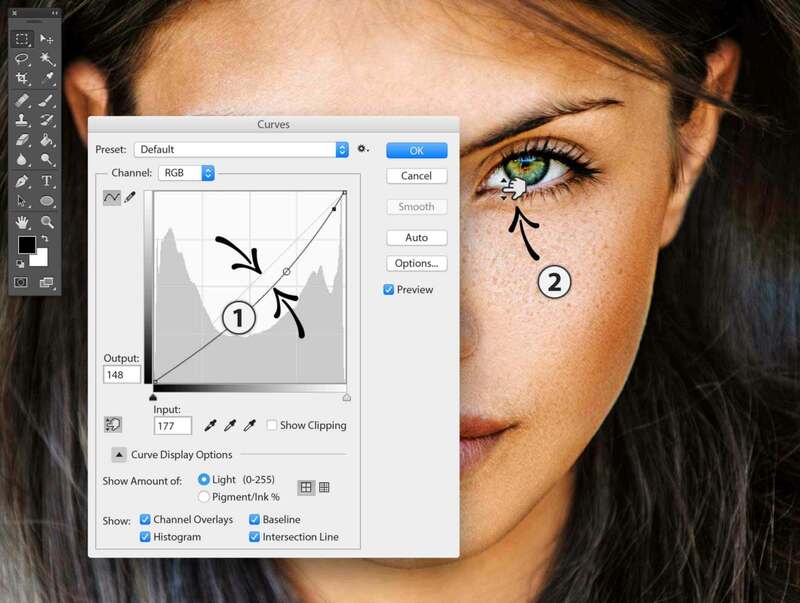 With the eyedropper over her eye get ready to click and drag down — the travel distance between the point where you click the mouse and the point you will release the mouse measures roughly 8 pixels! In the image below we can see the adjusted curve in the Curves modal after it has been dragged. Curve will bow downward slightly. The On Image Adjustment Tool is only 8 pixels from where it started. The touchup portion of this tutorial is now complete. In the following image below we can see the slight variation we created with the Curves adjustment. 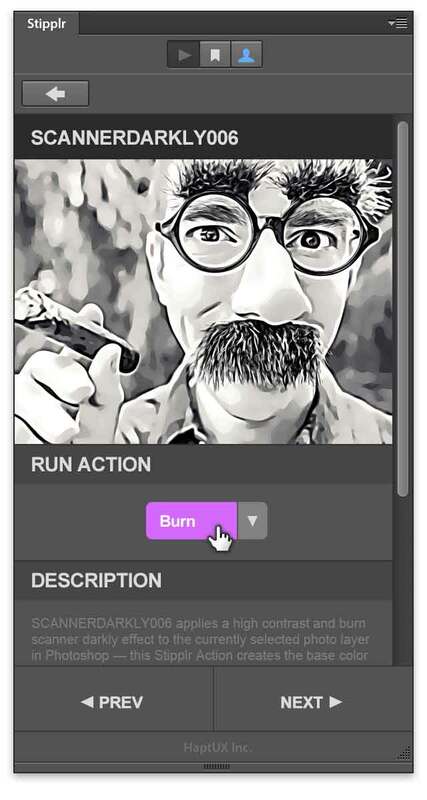 The first Stipplr Action we will apply to our source photo is SCANNERDARKLY006 — this Action generates a style similar to the one seen in the movie A Scanner Darkly starring Robert Downey Jr. However, our goal is not to create a Scanner Darkly effect, we are only interested in achieving the sharp contrast result which the SCANNERDARKLY Actions typically generate. And with the right blending mode applied to the SCANNERDARKLY layer we can fake a pretty decent High Dynamic Range look, or pseudo-HDR (a very graphic one). This resulting pseudo-HDR will be what goes on to becoming our graphic novel rendering. 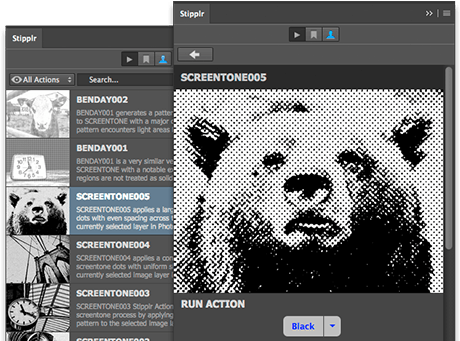 With the proper image layer selected it’s now time to run our first Stipplr Action. Within a moment the following result appears (below). 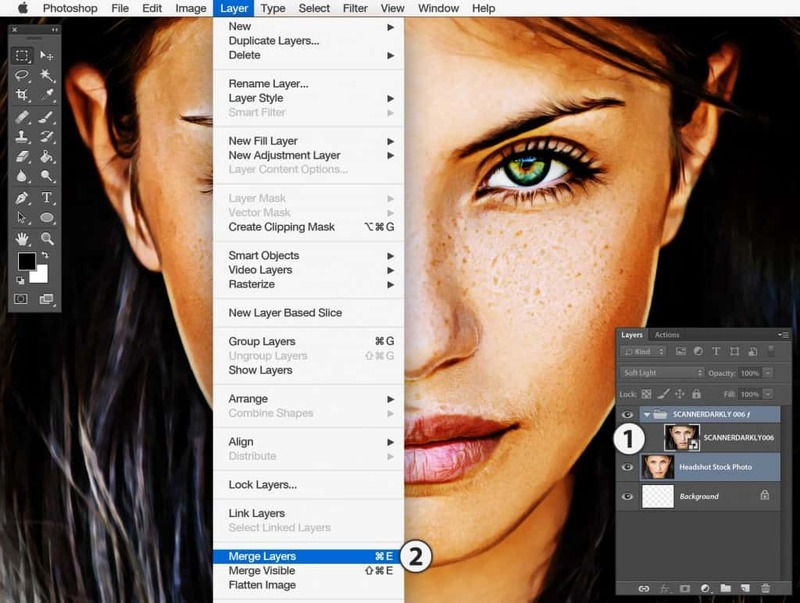 As shown in the Layers panel within the image above, Stipplr always works on a copy of the selected image layer leaving your original intact. 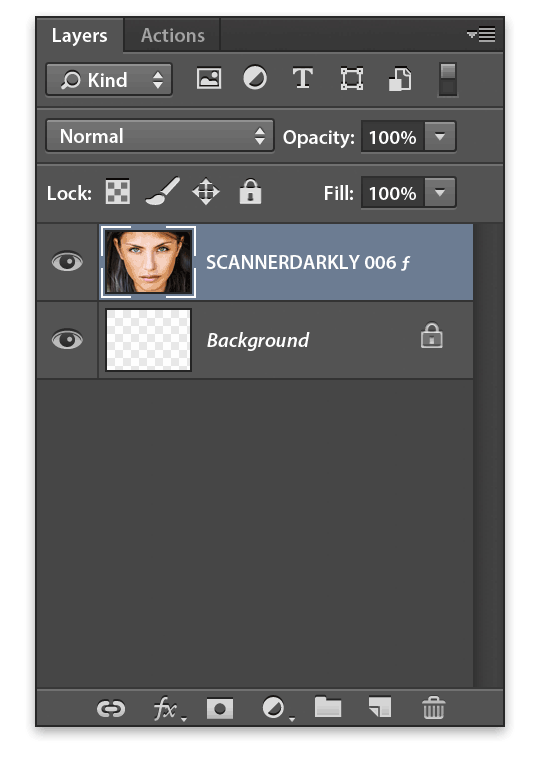 The SCANNERDARKLY Action series does not generate a vector shape layer. The purpose of this Action is to create a colour base from which we can overlay dark Adobe shape layers such as linework generated from other Stipplr Actions. In this specific case we are not interested in building up the Scanner Darkly effect but rather to bake in the dark contrast into the photo we just touched up. Select the SCANNERDARKLY 006 ƒ group. Set the Blending Mode for this group to Soft Light. 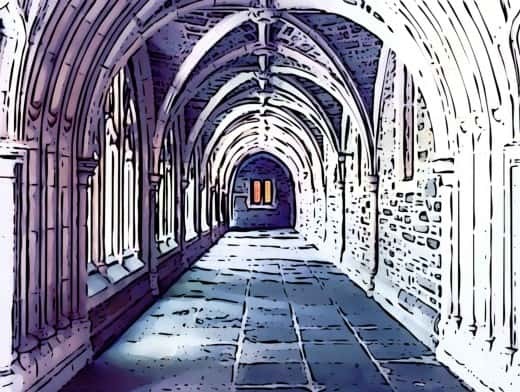 And this is the new pseudo-HDR style source photo we will be using to create our graphic novel effect. While it looks like we have our new source photo we still have one more step to do first — merge the SCANNERDARKLY effect with the original source layer. While pressing the Command Key on your keyboard (Control Key on Windows), select the source image layer. The name of this new layer is taken from the layer which was merged down. Below, the result we want as a source layer for our graphic novel effect which we will start next. Stipplr Actions are specifically designed to only process 1 image layer at a time, and it does not work on groups, therefore we must merge the group with our source layer. If you don’t want to loose the work done to your original photo you can simply duplicate the layer or save a copy of the current file for safe keeping. And here is a comparision between the photo we started with and the current pseudo-HDR result. Hopefully this insight into how this photo was prepared prior to creating the graphic novel effect helps to remove some of the mystery about how the final result was acheived. The Stipplr Actions on this site were not designed to dodge hard work — designers still need to rely on their skill and training to achieve their desired results. The graphic novel effect we will be creating in this tutorial is made using 3 gray tone vector Adobe shape layers ending with a halftone print pattern. While applying the following Stipplr Actions to acheive our desired result takes about 20 minutes, there was about 45 mins of effort spent on rendering a few dozen Stipplr Actions until falling upong the exact sequence used below. If you are following along with this tutorial using a different photo then in all likelihood you will have to combine different INKER and HALFTONE Stipplr Actions to achieve a similar result. 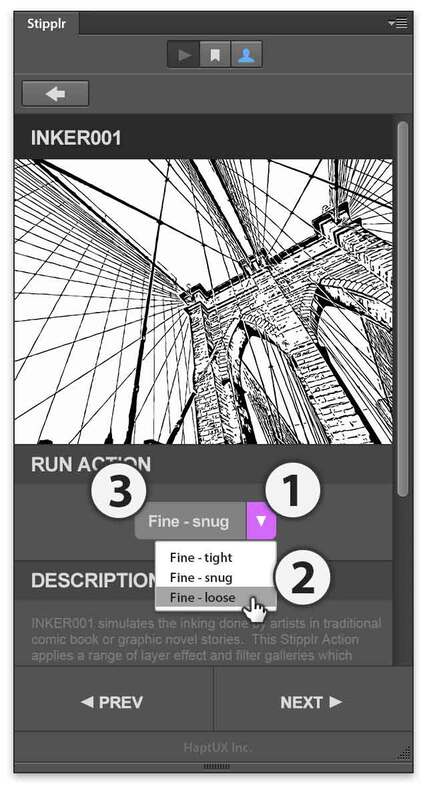 Our first Stipplr Action will act as the first of our 3 grayscale tone shape layers. 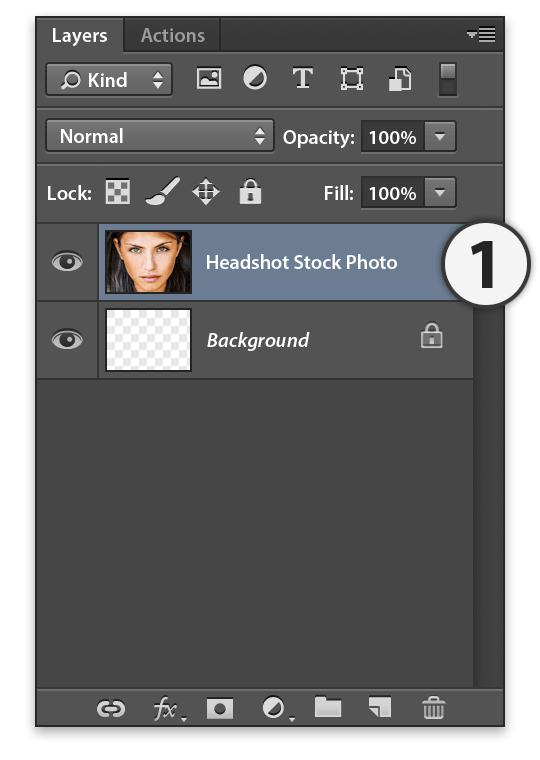 Select the source photo in the Layers panel (note that the source photo has been renamed to the the merge proceedure above). 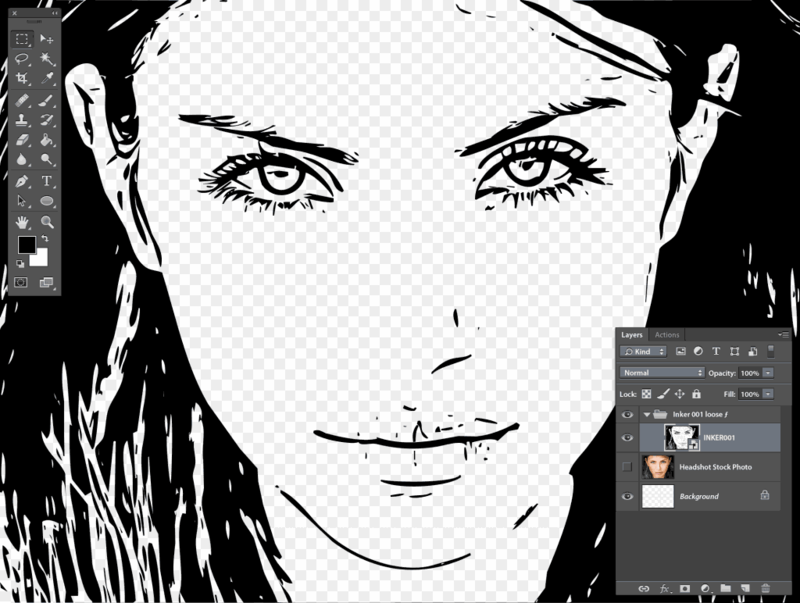 With the source image selected it’s time to apply the INKER001 Stipplr Action. The INKER series has more than one core script. Depending on a designer’s requirements, they can choose the tolerance level of the vector linework they wish to generate. These include tight, snug and loose — we are using loose in this tutorial to give our final Adobe shape result a more organic feel. Within a few moments the following Adobe shape layer is generated. The dark vector shape layer result can be hard to make out because Stipplr Actions are designed to ignore white, a similar result to how the image trace feature in Illustrator works. 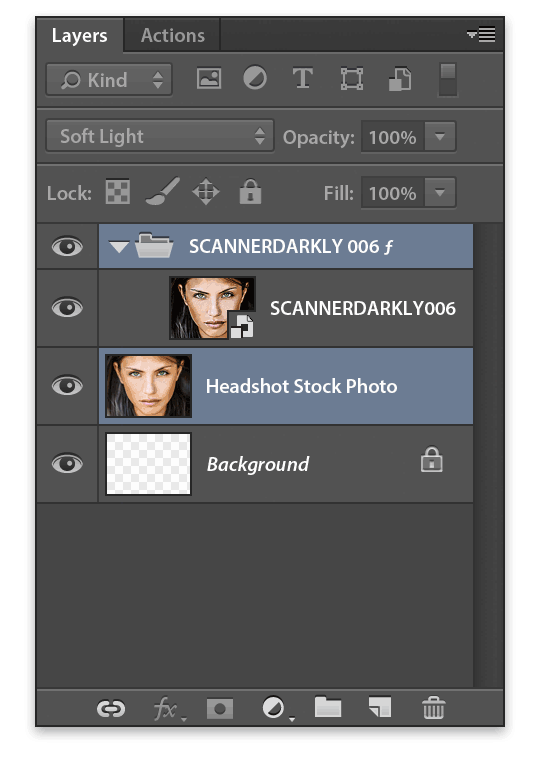 This means the source image always pokes through the transparent portions of the Adobe shape layer. And here is the result with the source layer toggled off. The only change we will make to this Adobe shape layer is to set the group opacity to 33% — the reason for this will become clear when we start compositing the other INKER shape layers with this one. 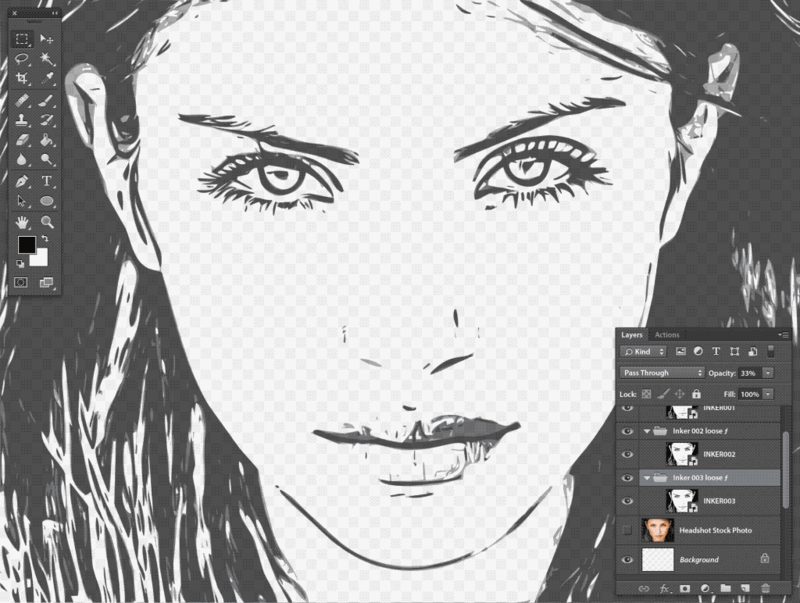 We are done with the INKER001 Adobe shape layer. 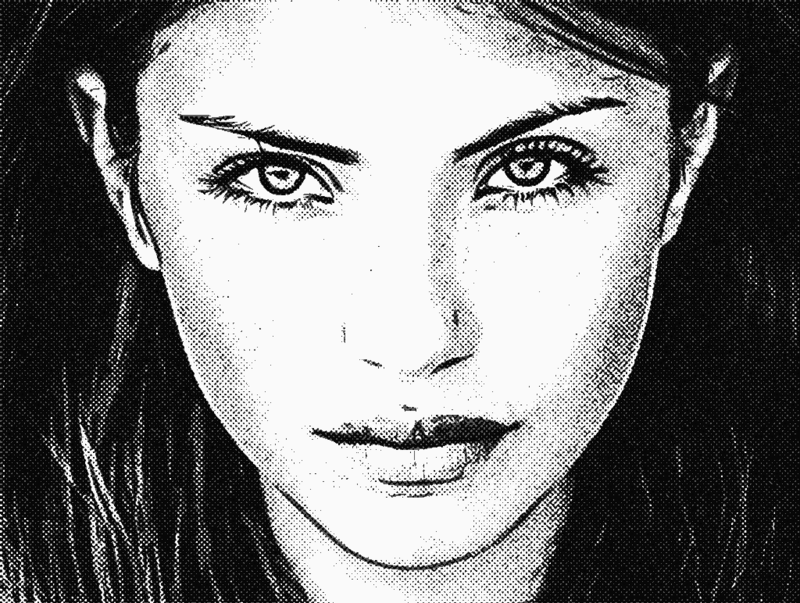 To complete the graphic novel effect composition we still need to apply INKER002, INKER003 and HALFTONE003 to our source layer. However, executing these Stipplr Actions is a near identical process to what we completed in STEP 7 through STEP 9 so we will condense the remainer of the tutorial into smaller steps by using less screen captures. If at any time you get stuck, just remember that you can refer to STEP 7 through STEP 9 to fill in any gaps. 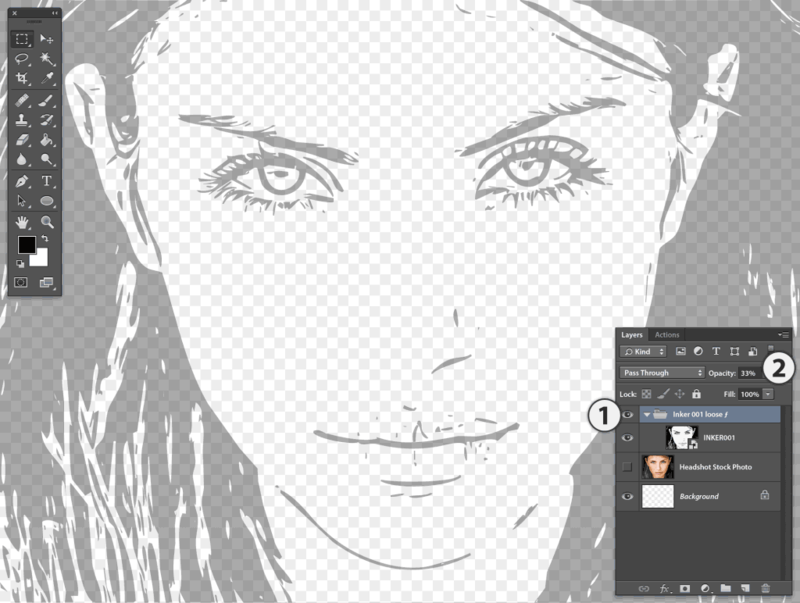 Next we will apply INKER002 which is very similar to INKER001 but with minor variances to the resulting linework. Applying INKER002 is an identical process to INKER001 so we will condense STEP 7 through STEP 9 into a single step below followed by the final result. The following is the INKER002 result. Notice how the results are difficult to see due to our source layer poking through the transparent vector shapes. 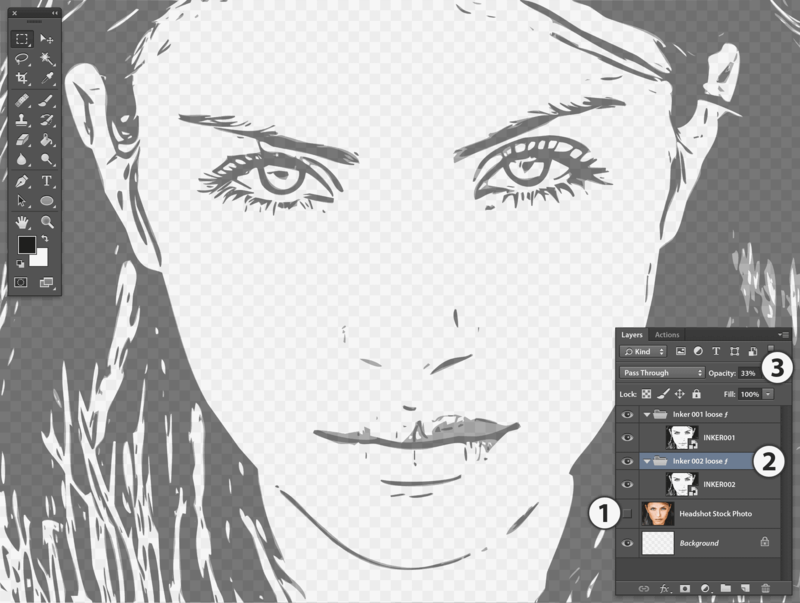 Stipplr always places the vector shape results on the layer directly above the source layer. To view the final results more clearly, lets hide the source layer. Already we can see how our Adobe shape vector layers are building up — the opacity settings on the groups are creating a darker tone where the solid shapes from both INKER results intersect. Next on our list is applying INKER003 which, like INKER002, is also very similar to INKER001 but with enough variation to create a slightly different result. And as with the INKER002, here we see INKER003 with the source image poking through making it harder to see the result. And below is our composition so far with the Inker 003 ƒ group set to 33% opacity and the source photo toggled off for easier viewing. With our grayscale base now complete we move onto simulating the halftone pattern generally associated with printed graphic novels. And here is our composition to date with the source photo toggled off (the opacity levels for the HALFTONE003 result remains at 100%). Here is a comparison between our original source photo and the resulting Stipplr Graphic Novel composition. Because the background is transparent you can choose to put whatever colour or effect you desire. There are no silver bullets using Stipplr Actions. In most cases you should expect to perform some touchups to your source content to ensure the best results — and in all cases you should expect to experiment with multiple combinations of various Stipplr Actions to achieve the result you are envisioning.